He’s the former Jura distillery manager renowned throughout the Scotch industry for his friendly persona and whisky knowledge. But this summer it was time for Willie Cochrane to hand over the reins at Jura to Graham Logan and embrace a well-earned retirement – though by no means a quiet one, as he tells Melita Kiely. ‘What happened was, if you go back a long time ago to 1977 when I started at Jura distillery, I was in the lowliest job available. So in the distillery you had the mashman, stillman and tun room man. Now, because my background was in engineering, I quickly progressed from being the mashman to the stillman, which was the next step up. ‘I had only intended to stay on Jura for a year, but I was progressing and my wife Rose also got a job on the island, so that made life a bit more bearable here. ‘We decided we’d stay for another year. But then what happened was the manager left the distillery and the assistant manager asked me if I wanted a job as a brewer. So again, we decided to stay on the island. ‘Jura gets into your blood – it’s that kind of place. I love it. And I was fixing people’s cars – I was a mechanic before in Glasgow, where I’m from – I had a good life. I’ve always enjoyed working with tools; I’m a hands-on kind of guy. ‘My favourite part of the job? Obviously all the different styles of whisky and bottles of whisky that I have been making over the years. A major part of my job is meeting and greeting people. I love to meet people coming from all over the world. I’ll be sitting in my office and someone will say: “There’s a group on a tour and they want to meet you.” I always loved that part of the job; I love making people feel welcome on the island. ‘I’ve done some travelling as well, though. I went to Japan for Whisky Live Tokyo about 10 years ago and I loved that. But I took an illness and that stopped me travelling. So what the company said was rather than you go, we’ll bring them to you. So I entertain them on Jura and I look after them. ‘I was on 3 Men in a Boat for the programme and I met Prince Albert of Monaco on Jura. I looked after him for a day. He was staying in the lodges. I took him shooting and obviously he had a big entourage, and we had a TV chef cooking for him as well. ‘Before he went away, I said to him: “Do you fancy a pint?” And so I went to the pub with the Prince of Monaco – he was a really nice chap. I also looked after Ian Botham, the cricketer, when he came to Jura. ‘My favourite whisky on the shelf is Jura 16-year-old, that’s my dram of choice. But I love the One for the Road. I am very honoured to share that Jura, it’s beautiful. I still can’t believe the guys at the distillery did that for me. It really is a very, very nice gesture. ‘I will miss working here. There are over 100,000 honorary Diurachs – that’s the Gaelic word for the community of Jura – and people who sign up get a business certificate, and my name’s probably on 99% of them. They’re like my children; some email me saying: “Hello daddy”. ‘Though I’m retiring, I’ll still be doing some ambassador work for the distillery and consulting. I don’t think I could turn my back on it completely... I love Jura, it’s a part of me. ‘The thing that always got my wife was that she didn’t see the grandchildren as often as she could have living on the island. I have three children and four grandchildren. It’s expensive travelling back and forth all the time, but hopefully now we’ll have a bit more time to see them. ‘My wife was a school secretary and marriage registrar on Jura. Our house is the registry office and people get married in our home. Sometimes I had to be the best man or photographer. I think she’s married about 30 couples, from people in London to people coming from Canada and local people – even my children got married in the house. 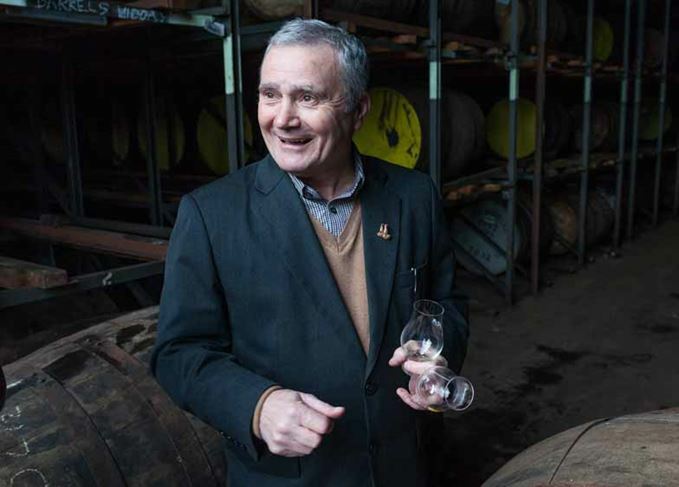 ‘When it comes to whisky heroes, I am not just being biased but I always look up to the men who work in my distillery. They work 12-hour days. These guys constantly do it and they are the best at what they do. It’s been an absolute pleasure working with them all. I love the island and that whole world. It’s always about Jura, so I look up to all the guys. After a 39-year career, Willie Cochrane is to be succeeded by long-time colleague Graham Logan.